Inspired by our bodies' sensory capabilities, researchers at the Harvard John A. Paulson School of Engineering and Applied Sciences and the Wyss Institute for Biologically Inspired Engineering have developed a platform for creating soft robots with embedded sensors that can sense movement, pressure, touch, and even temperature. To fabricate the device, the researchers relied on an established 3D printing technique developed in the lab of Jennifer Lewis, the Hansjorg Wyss Professor of Biologically Inspired Engineering at SEAS and Core Faculty Member of the Wyss Institute. The technique - known as embedded 3D printing - seamlessly and quickly integrates multiple features and materials within a single soft body. "This work represents the latest example of the enabling capabilities afforded by embedded 3D printing - a technique pioneered by our lab," said Lewis. "The function and design flexibility of this method is unparalleled," said Truby. 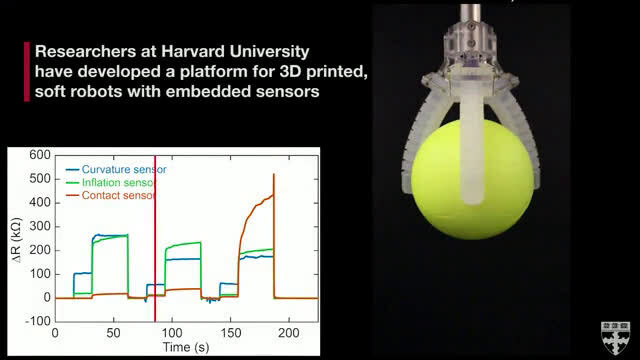 "This new ink combined with our embedded 3D printing process allows us to combine both soft sensing and actuation in one integrated soft robotic system." To test the sensors, the team printed a soft robotic gripper comprised of three soft fingers or actuators. The researchers tested the gripper's ability to sense inflation pressure, curvature, contact, and temperature. They embedded multiple contact sensors, so the gripper could sense light and deep touches. 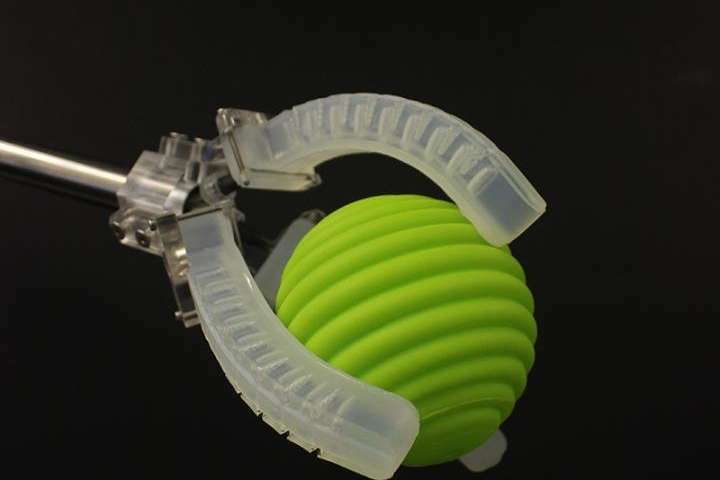 "Soft robotics are typically limited by conventional molding techniques that constrain geometry choices, or, in the case of commercial 3D printing, material selection that hampers design choices," said Robert Wood, the Charles River Professor of Engineering and Applied Sciences at SEAS, Core Faculty Member of the Wyss Institute, and co-author of the paper. "The techniques developed in the Lewis Lab have the opportunity to revolutionize how robots are created - moving away from sequential processes and creating complex and monolithic robots with embedded sensors and actuators."